Hi! This is Rachel Malay, director at the Port Library in Beloit. For the next few weeks I’ll be reviewing books new to our children’s department in honor of summer library program. This Tuesday is Independence Day, and the library will be closed for that day only. We’ll be open our regular hours Monday and Wednesday, and through the end of the week. If you would like a book this summer that is pretty light on the actual reading part, try out author/illustrator Daniel Miyares. His books are nearly wordless picture books, though they tell fantastic stories. The latest to the library, That Neighbor Kid, follows a young girl in pigtails as she tries to make friends with her new neighbor. The title page shows a moving truck in front of a suburban house, drawn in ink tones of grey. The inquisitive little girl looks over her new fence to see a funny young boy reading a book upside down in a tree. She hides when the boy starts taking fence slats down, but creeps closer to see that he is actually building a tree house! It becomes apparent he could use some help, and as the two continue their project together the world around them starts to come into color, first with the autumn leaves on the tree, then the late afternoon sunshine, and finally blue paint as the tree house is completed. The world returns to grey as night comes, but now instead of a moving van between the two houses there is a tree house, and two new friends wave to each other from warmly lit bedrooms. You can count on Lemony Snicket to deliver a story just a little offbeat. His Series of Unfortunate Events books didn’t shy away from presenting a tragic and sometimes dark storyline, aimed at grade school children. Since then he’s come out with another series for grade school readers, but also ventured into picture books, with one winning an award. His latest picture book is just as quirky. 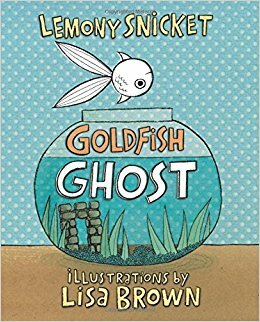 Goldfish Ghost follows an unnamed ghost of a goldfish who floats upside down, illustrated in black and white, through a world of color. Lisa Brown does the illustrations. Goldfish Ghost floats up from an abandoned bowl in the empty room of a little boy who lives in a seaside town. After a time Goldfish Ghost gets lonely as there’s no one to talk to in the boy’s room, and floats out the window. The gulls at the pier ignore the ghosty fish, so he floats on the breeze into town and back out to the seashore, but everyone here ignores him floating silently above them. Out at sea all the fish ghosts floating upside down above the waves are friendly enough, but it’s not quite home for Goldfish Ghost. After attempting to return to his old bowl and finding it occupied by a new living fish, Goldfish Ghost finally heeds the call from the haunted lighthouse. Who could be calling from all the way up there? For the next few weeks I’ll be reviewing books new to our children’s department in honor of summer library program. Can you believe it? Summer programs are nearly half over at the library! I hope everyone’s summer plans are going along well, whether you are on the farm, on vacation, or just trying to stay cool. Tuesday is the first day of summer, although I’m sure the weather has been reminding us of that for a few weeks now! This week’s Port Pick celebrates that wonderful season of the year from the end of school to the dog days. And Then Comes Summer by Tom Brenner, with illustrations by Jaime Kim captures the joy of long sunny days with just a bit of nostalgia for classic summer activities like ice cream breaks, fireworks, trips to the lake, lemonade stands, and bicycle rides. The illustrations are in bright inky colors, done in a cartoonish style that evokes all the youthful joys of a summer day. The rhyming text follows a “when…” and an answer “then…” on each page, starting with warming weather and lengthening days, followed by the sound of lawn mowers and the end of school, to evening crickets, the Fourth of July, and finally settling down in your tent for a late summer camping trip. This story would be a great one to read to your young grade school aged child right at the end of school, or if you’re planning several weekends swimming at Lake Waconda. This is actually the third in a series by the same author, each title starting with “And then comes…” The library has And Then Comes Halloween as well, although it is illustrated by a different artist. It still has the same happy, bright, and fun feel though. For the next few weeks I’ll be reviewing books new to our children’s department in honor of summer library program. Do you know what dragons love to eat best? If you guessed princesses, you’re way off base. Dragons actually love to eat tacos best. The book Dragons Love Tacos says so! That title was so popular the author and illustrator have written another: Dragons Love Tacos 2: the Sequel by Adam Rubin and illustrated by Daniel Salmieri. At the end of the first book the reader was warned about what might happen if a dragon eats spicy salsa, but no one was prepared for the dragons’ voracious appetite. There is only one taco left in the world, and that one must be protected so it can be planted and new taco trees grow in its place! So, the hero of our tale and his trusty canine companion build a time machine to go back in time and stop the dragons from eating ALL the tacos and trying spicy salsa. Two attempts later the timeline is a little messed up and all the tacos are still gone. A mistake with the time machine produces some silly results, like tacos eating dragons. Will the world remain taco-less? Give this short picture book a try to find out. In an uncluttered landscape the colored pencil and ink illustrations stand out. There are even a few sight gags for the grown-ups reading the book. For the next few weeks I’ll be reviewing books new to our children’s department in honor of summer library program. Programs start Tuesday and Friday of next week. If you have questions give the library a call on Monday. Predicting the future is usually best left to weather forecasters and insurance salesmen, but in everyday tasks you can usually predict what will happen. Forget sunscreen? You’ll turn red and tender. Feel the need for a glass of milk? You’ll be leaving the jug just a little lighter. One fold-out section features not only smiles in a roller coaster car before, but shocked expressions after! The fold-out shows a pretty wild ride with the word “during.” This book is a quick read that should leave the readers – both young and old – with a few giggles.